. . . this is better hot-hydrogen LENR work than I’ve seen anywhere before. oxidation method. Observed heat data for room temperature were of chemical level. material analyses by XRD, TEM, STEM/EDS, ERDA, etc. are to be reported elsewhere. interaction of nano-composite metals and H(D)-gas. This is a summary of Takahashi TSC theory. Takahashi found that the rate of 3D fusion in experiments where PdD was bombarded by energetic deuterons was enhanced 10^26, as I recall, over naive plasma expectation. This led him to investigate multibody fusion. 4D, to someone accustomed to thinking of plasma fusion, may seem ridiculously unlikely; however, this is actually only two deuterium molecules. We may image two deuterium molecules approaching each other in a plasma and coming to rest at the symmetric position as they are slowed by repulsion of the electron clouds. However, this cannot result in fusion in free space, because the forces would dissociate the molecules, they would slice each other in two. However, in confinement, where the dissociating force may be balanced by surrounding electron density, it may be possible. 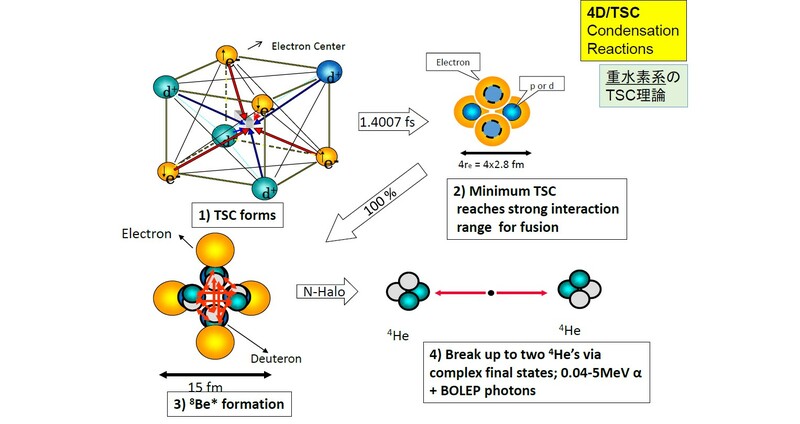 Notable features: the Condensate that Takahashi predicts includes the electrons. Fusion then occurs by tunneling to 100% within about a femtosecond; Takahashi uses Quantum Field Theory to predict the behavior. To my knowledge, it is standard QFT, but I have never seen a detailed review by someone with adequate knowledge of the relevant physics. Notice that Takahashi does not detail how the TSC arises. We don’t know enough about the energy distribution of deuterium in PdD to do the math. Because the TSC and resulting 8Be are so transient, verifying this theory could be difficult. Notice that Takahashi does not specify the nature of the confining trap that allows the TSC to arise. From experimental results, particularly where helium is found, the reaction takes place on the surface, not in the bulk, so the trap must only be found on (or very near) the surface. Unless a clear connection is shown, this theory is dicta, not really related to the meat of the presentation, experimental results. Page 5: Comparison of Energy-Density for Various Sources. We don’t need this fluff. (The energy density, if “cold fusion” is as we have found, is actually much higher, because it is a surface reaction, but density is figured for the bulk. Bulk of what? Not shown. Some LENR papers present a Rankin diagram, which is basically the same. It’s preaching to the choir; it was established long ago and is not actually controversial: if “cold fusion” is real, it could have major implications, providing practical applications can be developed, which remains unclear. What interests us (i.e., the vast majority of those at an ICCF conference) is two-fold: experimental results, rather than complex interpretations, and progress toward control and reliability. Page 6: Comparison of Various Energy Resources. Please, folks, don’t afflict this on us in what is, on the face, an experimental report. What is given in this chart is to some extent obvious, to some extent speculative. We do not know the economics of practical cold fusion, because it doesn’t exist yet. When we present it, and if this is seen by a skeptic, it confirms the view that we are blinded by dreams. We aren’t. There is real science in LENR, but the more speculation we present, the more resistance we create. Facts, please!!! Page 9. NEDO-MHE Project, by６Parties. Parties：Technova Inc., Nissan Motors Co., Kyushu U., Tohoku U., Nagoya U., Kobe U.
Yay! I’ll keep my peace for now on the “study for industrial application.” Was that part of the charge? It wasn’t mentioned. Page 10. Major Results Obtained. “Typical case” hides the variability. The expression of results in heat/moles of deuterium is meaningless without more detail. Not good. The use of differential scanning calorimetry is of high interest. System has 5 or 6 thermocouples (TC3 is not shown). Reaction chamber is the same for both test systems. It contains 4 RTDs. Page 17. ６ [sic, 16?] Collaborative Experiments. Chart showing results from 14 listed tests, 8 from Kobe, 5 from Tohoku, and listing one DSC study from Kyushu. These were difficult to decode. Some tests were actually two tests, one at RT (Room Temperature) and another at ET (Elevated Temperature). Other than the DSC test, the samples tested were all different in some way, or were they? Page 18. Typical hydrogen evolution of LM and power in PNZ6#1-1 phase at Room Temp. I have a host of questions. “LM” is loading (D/Pd*Ni), and is taken up to 3.5. Pressure? ZrO2 [filler].” How do we know that? What calibrations were done? Is this test 14 from Page 17? If so, the more optimistic result was included in the table summary. The behavior is unclear. The labs are not presenting data in the same format. It is unclear what is common and what might be different. The behaviors are not the same, regardless, which is suspicious if the samples are the same and they are treated the same. The difference, then, could be in the calorimetry or other aspects of the protocol not controlled well. The input power is not given in the Kobe plot. (This is the power used to maintain elevated temperature). It is in the Tohoku plot, it is 80 W, initially, then is increased to 134 W.
“2～8W of AHE lasted for a week at Elevated Temp. (H-gas)” is technically sort-of correct for the Kobe test (i.e., between 2 and 8 watts of AHP (this is power, not energy) started out at 8 W average and declined steadily until it reached 2 W after 3.5 days. Then it held at roughly this level for three days, then there is an unexplained additional brief period at about 4 W. The Tohoku test showed higher power, but quite erratically. After almost rising to 5 W, for almost a day, it collapsed to zero, then rose to 2 W. Then, if this is plotted correctly, the input power was increased to raise the temperature. 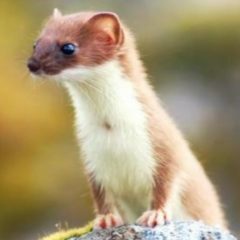 (for an environmental temperature, which this was intended to be, the maintenance power is actually irrelevant, it should be thermostatically controlled — and recorded, of course. Significant XP would cause a reduction in maintenance power, as a check. But if they used constant maintenance power, then we would want to know the environment temperature, which should rise with XP. But only a little in this experiment, XP being roughly 2% of heating power. At about 240 hours, the XP jumped to about 3.5 W. I have little confidence in the reliability of this data, without knowing much more than is presented. “Wex: 20W to 10W level excess-power lasted for a month.” This is puffery, cherry-picking data from a large set to create an impressive result. Yes, we would want to know the extremes, but both extremes, and we would even more want to know what is reliable and reproducible. This work is still “exploratory,” it is not designed, so far, to develop reliability and confidence data. The results so far are erratic, indicating poor control. Instead of using one material — it would not need to be the “best” — they have run a modest number of tests with different materials. Because of unclear nomenclature, it’s hard to say how many were different. One test is singled out as being the same material in two batches. I’d be far more interested in the same material in sixteen batches, all with an effort that they be thoroughly mixed, as uniform as possible, before dividing them. Then I’d want to see the exact same protocol run, as far as possible, in the sixteen experiments. Perhaps the only difference would be the exact calorimetric setup, and I’d want to see dummy runs in both setups with “fuel” not expected to be nuclear-active. One of the major requirements for calorimetric work, too often neglected, is to understand the behavior of the calorimeter thoroughly, across the full range of experimental conditions. This is plodding work, boring. But necessary. in RT and ET phases evaluated by TC2 temp. Re-calcined PNZ6. Page 24. Local large heat：Pd/Ni=1/7, after re-calcination of PNZ5. Uses average of RTDs rather than flow thermocouple. Page 25. Excess heat-power evolution for D and H gas: Re-calcined PNZ5. Which is 5,000 times of 0.02 MJ/mol-D by PdD formation! More fluff, that assumes there is no systematic error, distracting from the lack of a consistent experiment repeated many times, and that this is not close to commercial practicality. I was really hoping that they had moved into reliability study. Page 27. Radiations and flow rate of coolant BT400; n and gamma levels are natural BG. No radiation above background. Page 28. Excess Power Evolution by CNS2(Cu1Ni7/meso-silica). Appears to show four trials with that sample, from 2014, i.e., before the project period. Erratic results. Page 30. DSC Measuring Conditions： Kyushu University. See Wikipedia, Differential Scanning Calorimetry. I don’t like the vague variations: “mainly,” “mostly.” But we’ll see. Page 31. DSC Experiments at Kyushu University. No Anomalous Heat was observed for Ni and ZrO2 samples. Page 32. DSC Experiments at Kyushu University. Anomalous Heat was observed for PNZ(Pd1Ni7/ZrO2 samples. Very nice, clear. 43 mW/gram. Consistency across different sample sizes? Page 33. Results by DSC experiments: Optimum running temperature For Pd1Ni7/zirconia sample. Page 34. Results by DSC experiments; Optimum Pd/Ni Ratio. If anyone doesn’t want more data before concluding that 1:7 is optimal, raise your hand. Don’t be shy! We learn fastest when we are wrong. They have a decent number of samples at low ratio, with the heat increasing with the Ni, but then only one data point above the ratio of 7. That region is of maximum interest if we want to maximize heat. One point can be off for many reasons, and, besides, where is the actual maximum? As well, the data for 7 could be the bad point. It actually looks like the outlier. Correlation! Don’t leave home without it. Gather lots of data with exact replication or a single variable . Science! Later, on P. 44, Takahashi provides a possible explanation for an optimal value somewhere around 1:7., but the existence of an “explanation” does not prove the matter. Page 35. Summary Table of Integrated Data for Observed Heat at RT and ET. 15 samples. The extra one is PNZt, the first listed. Page 36. Largest excess power was observed by PNZ6 (Pd1Ni10/ZrO2) 120g. That was 25 W. This contradicts the idea that the optimal Pd/Ni ratio is 1:7, pointing to a possible flyer in the DSC data at Pd/Ni 1:7, which was used for many experiments. It is possible from the DSC data, then, that 100% Ni would have even higher power results (or 80 or 90%). Except for that single data point, power was increasing with Ni ratio, consistently and clearly. (I’d want to see a lot more data points, but that’s what appears from what was done.) This result (largest) was consistent between #1 and #2. I’m assuming that (“#”) means two identical subsamples. Page 37. Largest heat per transferred-D, 270 keV/D was observed by PNZ6r (re-oxidized). This result was not consistent between #1 and #2. Page 38. STEM/EDS mapping for CNS2 sample, showing that Ni and Cu atoms are included in the same pores of the mp-silica with a density ratio approximately equal to the mixing ratio. Page 40. Obtained Knowledge. I want to review again before commenting much on this. Optimal Pd/Ni was not determined. The claim is no XE for pure Pd. I don’t see that pure Ni was tested. (I.e., PZ) Given that the highest power was seen at the highest Ni:Pd (10), that’s a major lacuna. Page 41. 3. Towards Application（next-R&D). I disagree that those are the next phase. The first phase would ideally identify and confirm a reasonably optimal experiment. That is not actually complete, so completing it would be the next phase. This completion would use DSC to more clearly and precisely identify an optimal mixture (with many trials). A single analytical protocol would be chosen and many experiments run with that single mixture and protocol. Combining this with exploration, in attempt to “improve,” except in a very limited and disciplined way, will increase confusion. The results reported already show very substantial promise. 10-25 watts, if that can be shown to be reasonably reliable and predictable, is quite enough. Higher power at this point could make the work much more complex, so keep it simple. Higher power then, could be easy, by scaling up, and then, as well, increasing COP could be easy by insulating the reactor to reduce heat loss rate. With sufficient scale and insulation, the reaction should be able to become self-sustaining, i.e., maintaining the necessary elevated environmental temperature with its own power. Theory of mechanism is almost completely irrelevant at this point. Once there is an identified lab rat, then there is a test bed for attempting to verify — or rule out — theories. Without that lab rat, it could take centuries. At this point, as well, low cost (i.e., cost of materials and processing) is not of high significance. It is far more important at this time to create and measure reliability. Once there is a reliable experiment, as shown by exact and single-variable replications, then there is a standard to apply in comparing variables and exploring variations, and cost trade-0ffs can be made. But with no reliable reactor, improving cost is meaningless. This work was almost there, could have been there, if planned to complete and validate a lab rat. DSC, done just a little more thoroughly, could have strongly verified an optimal material. It is a mystery to me why the researchers settled on Pd/Ni of 7. (I’m not saying that’s wrong, but it was not adequately verified, as far as what is reported in the presentation. Within a design that was still exploratory, it makes sense, but moving from exploration to confirmation and measuring reliability is a step that should not be skipped, or the probability is high that millions of dollars in funding could be wasted, or at least not optimally used. One step at a time wins, in the long run. Page 43. The Making of Mesoscopic Catalyst To Scope CMNR AHE on/in Nano-Composite particles. Page 44. Binary-Element Metal Nano-Particle Catalyst. This shows the difference between Ni/Pd 3 and Ni/Pd 7, at the size of particle being used. An optimal ratio might vary with particle size, following this thinking. Studying this would be a job for DSC. Page 45. SNH will be sites for TSC-formation. To say that more generically, these would be possible Nuclear Active environment (NAE). I don’t see that “SNH” is defined, but it would seem to refer to pores in a palladium coating on a nickel nanoparticle, creating possible traps. of d-d pair and very dilute minus density spreading of electrons. Plausible. fusion theory” Akito Takahashi, Current Science, 25 February, 2015, and Takahashi, A.. “Dynamic Mechanism of TSC Condensation Motion,” in ICCF-14, 2008. Page 50. Trapped D(H)s state in condensed cluster makes very enhanced fusion rate. “Collision Rate Formula UNDERESTIMATES fusion rate of steady molecule/cluster/” Yes, it would, i.e., using plasma collision rates. Page 51. This image is a duplicate of Page 4, reproduced above. Page 52. TSC Condensation Motion; by the Langevin Eq. : Condensation Time = 1.4 fs for 4D and 1.0 fs for 4H Proton Kinetic Energy INCREASES as Rpp decreases. Page 53. 4H/TSC will condense and collapse under rather long time chaotic oscilation Near weak nuclear force enhanced p-e distance. Page 54. 4H/TSC Condensation Reactions. collapse to 4H, emission of electron and neutrino (?) to form 4Li*, prompt decay to 3He + p. Color me skeptical, but maybe. Radiation? 3He (easily detectable)? Page 55. Principle is Radiation-Less Condensed Cluster Fusion. Predictions, see “Nuclear Products of Cold Fusion by TSC Theory,” Akito Takahashi, J. Condensed Matter Nucl. Sci. 15 (2015, pp 11-22).